I’ve never been ruled by beauty or fashion. During my younger years, I considered myself a person of high ideals, far too serious-minded to care about superficial appearances. But fashion magazines and makeover shows were always a guilty pleasure. Now that I’m on the downslope of my forties, I appreciate the power of clothes that flatter the figure, colors that brighten the eyes, and some serious undereye concealer. Do I always look great? Hell, no! I’m often thwarted by frugality, lack of time and patience, a demanding day job, and just plain laziness. But I enjoy trying. Armed with handfuls of department store coupons and a growing arsenal of beauty products, I am trying to fight the (inevitable?) descent into frumpville. Bring your sense of humor and fight the frump with me! Amen!!! I hear you and couldn’t agree with you more. Glad I located your blog and will follow for sure. I’m fighting the same battle! 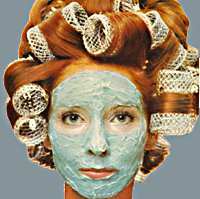 Love the picture with the facial masque! Love the picture as I came of age when girls were rolling their hair with orange juice cans. My hair was never long enough for those or to iron. I like to think of my hair as a native shrub. One day I came to school and it was flat. A student told me I looked like I just got out of bed. I told her she looked like she’d been dragged to school by wild horses. She winced. It goes both ways, I informed her. Now I make sure to gel my hair up as the kids always like to remember that teacher with the wild hair. No, no — thank you! I love the photos of the different outfits you put together. They provide good inspiration! 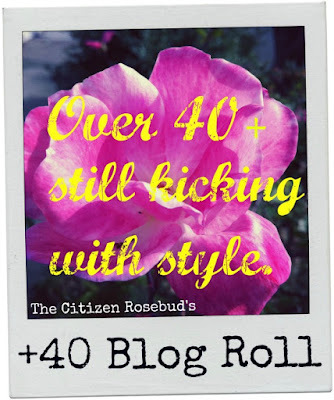 Found your blog thru the Citizen Rosebud +40 list. You have a wonderful sense of humor. Really enjoyed reading your posts. https://frumpfactor.wordpress.com/ – While fighting the frump within, do you ever just want to give up and let her win? Love your blog and will keep on following! Thank you so much! Greatly appreciated.